CLEVELAND, OH – October 10, 2008 - Mobile Awareness, LLC, a provider of leading-edge transportation safety products, is offering VisionStat™ Portable, a new transportable wireless camera system. 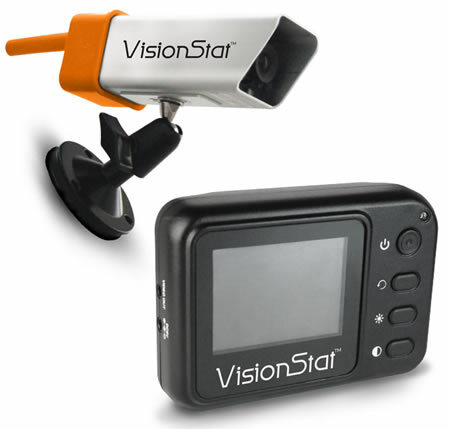 VisionStat™ Portable provides a safe and convenient solution for all types of towing applications, visual security, temporary use for backing and observation of valuable cargo. The VisionStat™ Portable camera system is cost-effective, easily installed, and allows the driver to back-up and align a towing vehicle using the removable, handheld monitor with a 2.4” LCD screen. The Night Vision enabled camera has a magnetic base to allow for flexible mounting which can be adapted for visual security purposes. Both the handheld monitor and the camera can be charged using either the vehicle power adapter or the plug-in AC adapter (both included) and can be conveniently stored after use. Additional features include the ability to switch camera views, to reverse the image when aligning a hitch, as well as adjust contrast and brightness on the portable monitor. Wireless camera transmission capability is up to 300 feet with night vision range of approximately 15 feet.